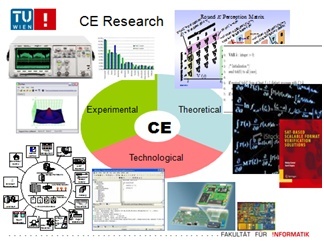 The Institute of Computer Engineering's research is devoted to all aspects of the direct interaction of computer systems and their environment, from the lowest level of circuit and hardware architectures to safety-critical cyber-physical systems like industrial automation & smart grids, healthcare, spacecraft, and automotive. Designing such systems is challenging, both from a scientific and technological perspective: Many functions are directly implemented in hardware for performance reasons, distributed and parallel processing is omnipresent, digital signal processing is often required, real-time and power/thermal constraints must be met, energy-efficiency is crucial, stopping operation in the case of failures is often not feasible, unique security issues and threats exist, "trial-and-error-style programming" is not an option in many applications, asserting system correctness by means of testing may be insufficient for the required reliability level, emergent behavior originating from autonomous operation must be understood and controlled, integration and complexity issues created by the upcoming Internet of Things must be managed, etc. Interdisciplinarity: Core computer science knowledge and skills like concurrent programming, modeling, design and analysis, formal verification and synthesis of both software and hardware are complemented by specific knowledge and skills from other disciplines, in particular, continuous mathematics, system theory and electrical engineering.